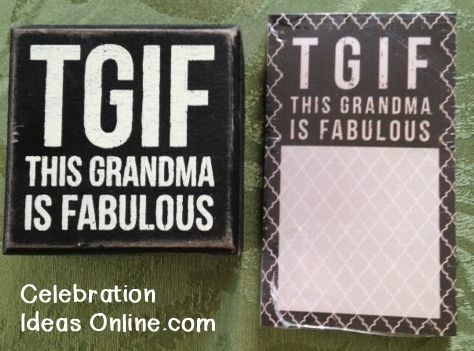 Gift for grandmothers.. a special adorable wooden box sign celebrating the Fabulous Grandmas in your life... A 3"x3"x1.5" TGIF box sign reading This Grandma is Fabulous! Also included is the new mini TGIF notepad too ! This a great gift for Easter baskets,Valentines Day, Mothers Day, birthdays or a fun gift for a New Grandma. Comes ready to giving in cellophane gift bag with ribbon and gift tag! Free shipping too! Only available for shipment within United States at this time. If your order is a gift please let us know what names (to and from) you would like on the gift tag! Please note these box signs are rustic by design and have weathering and rubbed through finishes. Each piece looks different and these are not defects.